Leaked Aluminum MacBook Pro Case Photo? 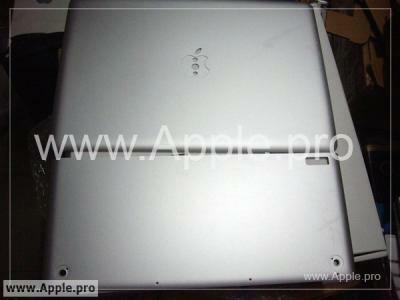 A blog entry (in Chinese) claims to have a photograph of prototype case housings of the upcoming redesigned MacBook Pro. The photo depicts what appear to be top and bottom housings of a Mac laptop sitting on a box. The housing resembles the current design of the MacBook Air but with a few notable differences. The logo in the prototype casing, for example, is no longer backlit. The screw configuration of the bottom case also does not match the current Air design, eliminating the possibility that this is just a photo of the Air's casing. There also appears to be no explanation for the additional circular indentations in the Apple logo, but could presumably be an artifact of being prototype casing. They do claim the battery would be more rectangular than square (not pictured) and the keyboard would be the same as the MacBook Air. The bottom case is smaller than the top case, but the additional space would likely be made up for by a removable battery. Apple has been rumored to be working on new aluminum MacBook Pro designs that will adopt features of the current iMac and MacBook Air. While the photo is consistent with rumors, we are always reluctant to believe that anonymously leaked photos are legitimate. More often then not, they turn out to be fake fan-created images, though there have been some legitimate leaks from Chinese sources.